It started off a perfect start to a great race that ended tragically. The night before my boyfriend and I had dinner at The Daily Catch, an amazing hole in the wall Italian restaurant in the North End of Boston. We managed to snag a table without waiting and if you’ve ever been to this place you know that’s tough.. especially on one of the busiest nights for carb loading. 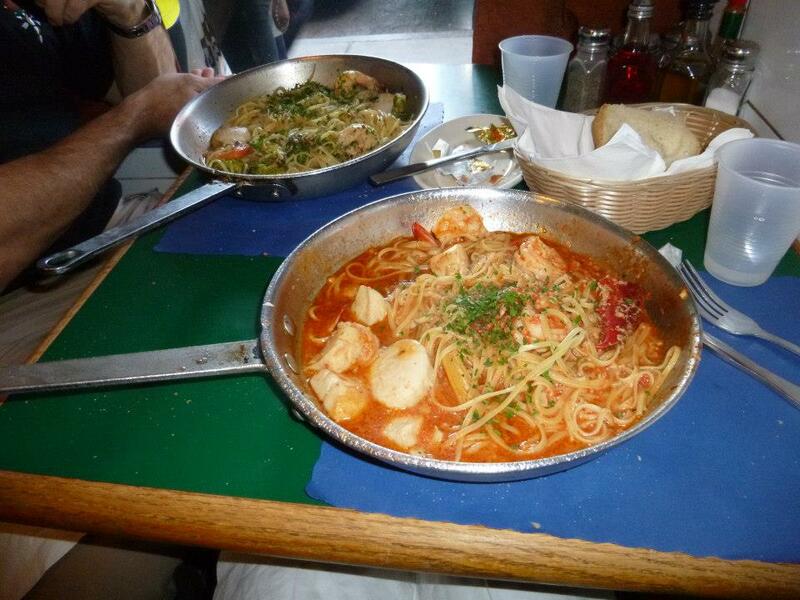 I had shrimp and scallops tossed in a tomato sauce served over pasta. The “plate” was the pan it was prepared in. From walking around all day, I was famished and ate every last bite! I was in bed by 9:30 pm and fast asleep shortly thereafter. The next morning I felt great. I had breakfast and was ready to go. Myself and group of friends were fortunate enough to get linked up with the Massachusetts State Police and their program for military, DoD and police officers to be shuttled to the start in coach busses. We were picked up from our hotel and had police escorts to the start line where we could sit on the warm bus until the start. This was incredible. I was in the second wave and ran with a good friend with the same goal of keeping a 7:30-8 minute pace. My boyfriend was in the third wave so he started 20 minutes behind us. As the race went on, all that really stands out is the crowds. Every inch on the course was covered in screaming people cheering us all on. It didn’t matter if they knew you or not, they would yell your bib number or name if you happened to write it on your bib. The signs were great as well. A few I remember were, “Today is the only day it’s ok to POOP your pants” or “ It’s called a marathon, if it were easy, it would be called your mother.” Maybe not so appropriate but still made me laugh. The volunteers at all of the water stations were phenomenal. I always thank a volunteer whether it is the beginning, end or anywhere in-between because these races would not happen without them. There were even runners along the course who had bottles of water and extra gels they were offering to anyone around them who might have needed it. We finished the race in 3 hours 30 minutes exhausted and ecstatic. We didn’t hit our “A” plan which was lower 3:20’s but still qualified for next year. As we made our way through the line to get food and our medals I stopped to wait for my boyfriend who was 20 minutes behind. At this point I stopped walking which is not a good thing, my hip flexors seized up and I started to get very cold to the point I was physically shaking. I finally found my boyfriend and we managed our way to our pickup point where we were shuttled to the Boston Athletic Club to get cleaned up and for post race food and beer. I left my phone in the hotel room because I figured I wouldn’t need it since I’d be with my boyfriend and I have an international phone. When I was in the locker room one of the ladies came in and said a transformer blew up at the finish line. At the time I didn’t think there were any down there because I was just there walking around the day before. As I emerged from the locker room and saw the news I realized it was much worse. My heart dropped as I saw the causalities from the blast on what had started off to be a great day. At this point my boyfriend’s phone was blowing up with texts and phone calls checking to see if we were ok. I had no way of contacting anyone so thanks to social media I was able to post a message on my Facebook page stating I was not injured. As time passed and more information was released, I realized I was very lucky because everyone I was with at the finish line with made it out of the area about 5 to 10 minutes before the bombs went off. I was also very fortunate that the rest of my friends at the race managed to make it out uninjured as well. Through this nightmare, I cannot begin to explain the gratitude I have for Bostonians and the running community in general. People reached out to me I didn’t even know offering help in any way. It was truly a moving thing to experience. My heart goes out to all of those injured or killed during this tragic event. I know I will be back next year and it will forever hold a place in my heart.